dLife is proud to present Healthline’s in-depth report: The State of Type 2 Diabetes, which covers every aspect of managing diabetes from lifestyle, weight and stigma, stress and fatigue, generational and gender divides to medical concerns, access to care and more. If Type 2 diabetes isn’t on our minds, it should be. The United States is the developed-world capital of the disease. Close to half of Americans either have Type 2 diabetes or its precursor condition, prediabetes. It accounts for 1 of every 7 dollars we spend on healthcare, according to the American Diabetes Association. And it increasingly affects millennials. Many studies have been done on various aspects of Type 2 diabetes: how treatments work, who is most affected, and the roles that diet, exercise, stress, and sleep play. Healthline decided to delve deeper into this world by looking at the day-to-day experiences and feelings of people who live with a condition that never gives them a day off. How are people with Type 2 diabetes managing the condition? Can they afford health care and lifestyle changes? How does the diagnosis change their perceptions of themselves and their future? Who helps them? And do the answers to these questions vary among generations? These are key questions that most studies don’t explore as completely as we would like. To get the answers, Healthline commissioned a survey of more than 1,500 people with Type 2 diabetes. We asked millennials, Gen Xers, and baby boomers to tell us about their perceptions, worries, and experiences. Then, to put our findings in perspective, we talked with individuals living with the condition and medical experts who have experience treating it. Some people claimed to be thriving with Type 2 diabetes, while others said they’re struggling. The vast majority are concerned about serious complications of the condition, such as vision loss or heart attacks. Many people, already busy with careers and families, find it hard to cope with the work of managing the disease — what one specialist called “a full-time job.” Substantial numbers are deeply concerned about whether they will be able to afford the treatments they need. And yet, many people with type 2 diabetes have succeeded in making big changes in their lives — eating better, exercising more — and see their diagnosis as the day they woke up and started paying attention to their health. 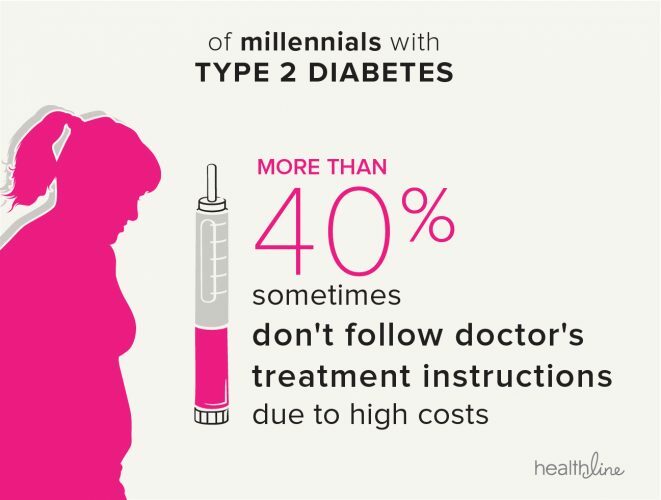 Healthline’s State of Type 2 Diabetes survey investigated the emotional challenges of the condition, identified stark disparities between generations, and explored people’s most pressing concerns. Weight loss is a major challenge. More than two-thirds of those with type 2 diabetes said their current weight negatively affects their health. Nearly half have tried losing weight multiple times, without long-term success. At the same time, more than 40 percent reported rarely exercising hard enough to break a sweat. One of the biggest challenges reported might surprise you: most people with type 2 diabetes — 55 percent — have trouble getting a full night’s sleep. Younger people have a harder time than older people with the emotional and financial challenges of Type 2 diabetes. There’s still a stigma attached to the condition — and millennials bear the brunt of it. Nearly half of millennials surveyed, and about a third of Gen Xers, reported hiding their condition out of worry about what others think. About the same number reported feeling negatively judged by some healthcare providers. Cost prevents more than 40 percent of millennials from always following their doctor’s treatment recommendations. There’s also a gender divide: women are more likely than men to say they put others’ needs before their own, and they face more challenges balancing their self-care needs with other responsibilities. Moreover, the majority reported feeling like they’ve failed if the results of an A1C test are too high. Many also reported feelings of strength, resilience, and optimism. People with Type 2 diabetes are well aware of the medical complications that can accompany the condition: two-thirds reported concern about all of the most serious complications. The biggest worries? Blindness, nerve damage, heart disease, kidney disease, stroke, and amputation. More than 60 percent of survey participants have never seen an endocrinologist or a certified diabetes educator, and the majority have never consulted a dietitian. That fits with research that shows a widespread shortage of professionals who specialize in type 2 diabetes — a problem that’s getting worse. Diabetes is a costly condition. Nearly 40 percent of survey participants are worried about their ability to afford treatment in the future. Healthline’s State of Type 2 Diabetes original survey and data can be provided to professional media and researchers by request. All reported survey data comparisons have been tested for significance at a 90 percent confidence level. Living with Type 2 diabetes can feel like a full-time job. On a basic level, this chronic condition affects the way the body metabolizes sugar, which is an important source of fuel. More than most, people with Type 2 diabetes need to eat in ways that maximize their health, exercise regularly and make other healthful lifestyle choices every single day. On top of that, they need to monitor their blood sugar levels. Many take medication daily. Although Type 1 and Type 2 diabetes differ in important ways, both involve problems with insulin, a hormone that regulates the movement of sugar into the body’s cells. When the body doesn’t produce insulin or stops using it effectively, sugar builds up in the bloodstream and causes a condition called hyperglycemia. In the early stages, this high blood sugar causes subtle symptoms, such as thirst and frequent urination. Left unchecked, it can damage blood vessels, nerves, eyes, kidneys, and the heart. Some diabetes medications raise the risk of hypoglycemia or very low blood sugar. This condition can cause serious problems, including loss of consciousness or even death. Type 2 diabetes develops when the body becomes resistant to insulin — meaning the hormone isn’t used effectively — or doesn’t produce enough insulin to keep blood sugar within a target range. It differs from type 1 diabetes, which is an autoimmune disease that halts the production of insulin. Type 1 diabetes often develops over the course of weeks, usually in children or young adults. In contrast, Type 2 diabetes often develops slowly. People can go for years without knowing they have it. To manage it, doctors generally recommend blood sugar monitoring, lifestyle changes, and daily oral medications. In some cases, treatment with insulin is needed. Depending on body mass index (BMI) and other factors, doctors may recommend weight loss surgery. According to the National Institutes of Health, a high BMI is linked to insulin resistance. It’s overly simplistic — even hurtful — to call type 2 diabetes a “lifestyle disease.” No one is to blame for developing it. The exact cause is unknown. Both genetic and environmental factors likely play a role reports the Mayo Clinic. Family history puts people at higher risk. Certain racial or ethnic groups, such as African-Americans, Native Americans, and Latinos, are also at increased risk. The disease is more common in people older than 40, though it increasingly affects young adults. 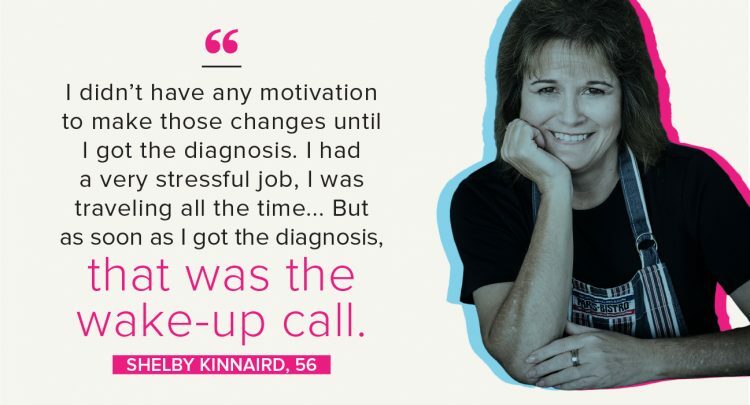 No matter when it’s first diagnosed, type 2 diabetes irrevocably changes people’s lives. Frequent doctor visits and tests to monitor blood sugar levels are recommended. Many people set dietary and exercise goals. They might need to address risk factors for complications too, such as high blood pressure or cholesterol levels. Learning to reduce stress is also crucial. Mental stress can raise blood sugar levels — and living with type 2 diabetes can be stressful. It takes an effort to juggle everyday life with the demands of a complex chronic condition. Lifestyle affects the risk and severity of Type 2 diabetes, and in turn, the condition can transform a person’s lifestyle. 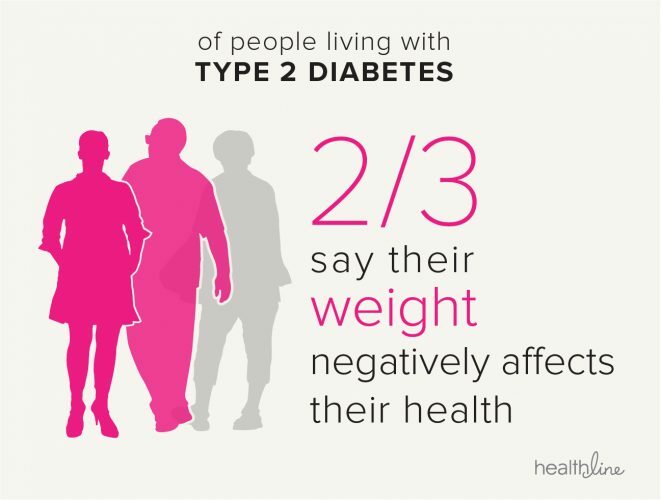 That’s why Healthline’s survey focused on how people with Type 2 diabetes fare on a day-to-day basis and how they feel about the disease’s impact on their lives. Healthline’s survey found that most adults — especially older adults — feel pretty good about how they’re managing type 2 diabetes. The vast majority said they’re well supported by loved ones. More than half reported feeling knowledgeable, self-reliant, or resilient on a daily or weekly basis. Following their diagnosis, most said they started eating more healthfully, exercising more, and managing their weight better. But there’s a flip side to that sunny picture. Two-thirds of survey participants said their current weight negatively affects their health. More than 40 percent said they rarely exercise hard enough to break a sweat. And sizeable minorities — especially younger adults — reported feeling exhausted, anxious, or guilty about how they manage the condition. These results may seem contradictory, but Type 2 diabetes is a complex condition. It’s a rare person who can follow all their doctor’s directions to a T. That’s why it’s important to stay realistic. Managing the disease is a balancing act: a small square of chocolate once in a while is fine, but a king-sized candy bar every day isn’t. “You’re meeting people where they are, and you’re helping them to make realistic lifestyle choices,” said Laura Cipullo, RD, CDE, who authored the book “Everyday Diabetes Meals: Cooking for One or Two.” In her practice, she helps people focus on long-term changes, not quick fixes. But even people who commit to changing their habits might find their efforts stymied by the occasional birthday party, work commitments, or factors beyond their control. Similarly, Cindy Campaniello, a leader for the Rochester, NY, chapter of the support group DiabetesSisters, works hard to balance the requirements of managing type 2 diabetes with the responsibilities of a busy life. Trying to stay on a specific diet is “horrendous,” she said, not because the food isn’t tasty but because of the time it takes to plan and prepare meals. Despite the effort they’ve poured into making healthy changes, close to half of participants in Healthline’s survey said weight management remains a big challenge: they’ve tried to lose weight multiple times without long-term success. That’s one of the reasons why permanent weight loss eludes so many. Another is that people facing weight challenges may not receive helpful medical interventions or any help at all. Piled onto these challenges is the stigma associated with type 2 diabetes and weight, especially for younger people. By being forthright about her condition, Merkerson hopes to lessen the embarrassment that many people feel. That’s why she’s an advocate for America’s Diabetes Challenge, sponsored by Merck and the American Diabetes Association. The initiative encourages people to make lifestyle changes and follow treatment plans to improve type 2 diabetes management. When Merkerson was diagnosed 15 years ago, she had to come to terms with how much weight she had gained. By the time she left Law and Order, she said, “I had a closet that went from a 6 to 16.” She felt some embarrassment about seeing her size increase on national television — but also was motivated to make changes.